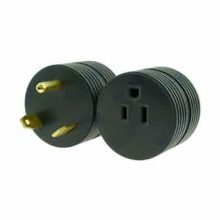 Camco RV 12″ 30M/30F PowerGrip Generator Adapter is a 3-prong adapter for use with Recreational Vehicles. 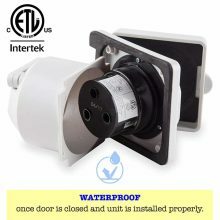 Designed to connect a generator with a L5-30 locking receptacle to an RV that uses a standard RV cord set (TT-30) to connect to 120V AC shore power. 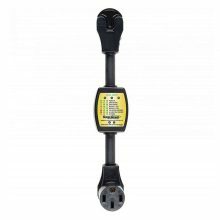 It features a patented PowerGrip handle to help make unplugging easier and is rated for 125V/3750W. It is also cCSAus certified. 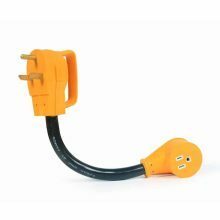 Camco’s 12″ RV Power Grip Generator Adapter connects a generator with a L14-30 locking plug receptacle to a recreational vehicle that uses a standard 50 AMP RV cord set. 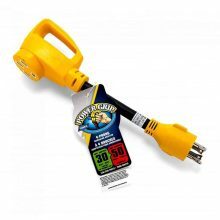 It features the patented Power Grip handle for ease of use and is rated for 125V/3750W. 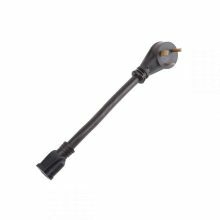 The adapter’s male end is a four prong L14-30 and female end is standard 50 AMP. 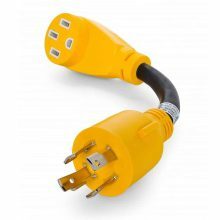 For use when RV has 15 AMP power and needs to plug into 30 AMP power source. 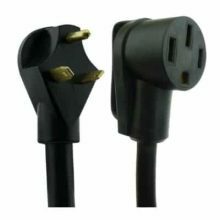 Pigtail Adapter Cord 3 Wire Grounding, 15A straight blade Female to 30A Male RV Power Cord Adapter. 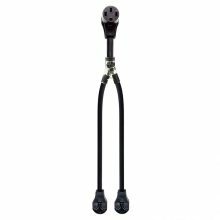 Made of heavy duty industrial grade material. Weather resistant. 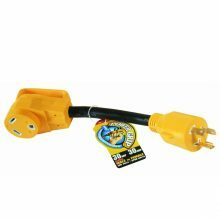 The 30M-50F adapter allows you to plug your 50 amp power cord into a 30 amp RV power source. 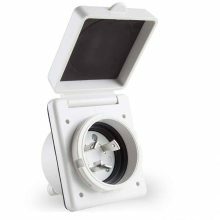 It adds versatility to your electrical hookups. 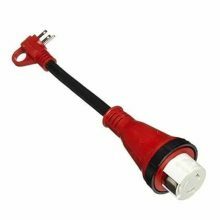 Pull handle plug design for safe and easy disconnect. Weather resistant. Inconsistent power at RV campsites can cause significant damage to your expensive electronic components. 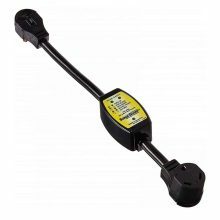 Check out the quality of shoreline power with the Surge Guard Surge Protectors, minimizing potential conditions that can damage equipment. Allow full use of RV appliances. Easy-T-Pull handles. 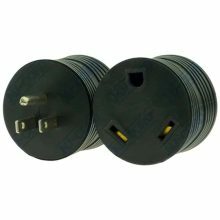 30 amp Male and female molded plug ends. Easy-T-Pull™ handles. Jacket made of durable PVC. 100% copper wiring. Weather-resistant. 35’ 10/3 Cord. 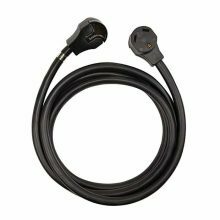 Valterra’s Mighty Cord Detachable 12″ Adapter Cord w/Handle features locking female receptacles with heavy-duty cable designed for outdoor use.